We played a 614 French vs 728+ point British force. Though at first we thought we were playing a 600 vs 600 game per side. 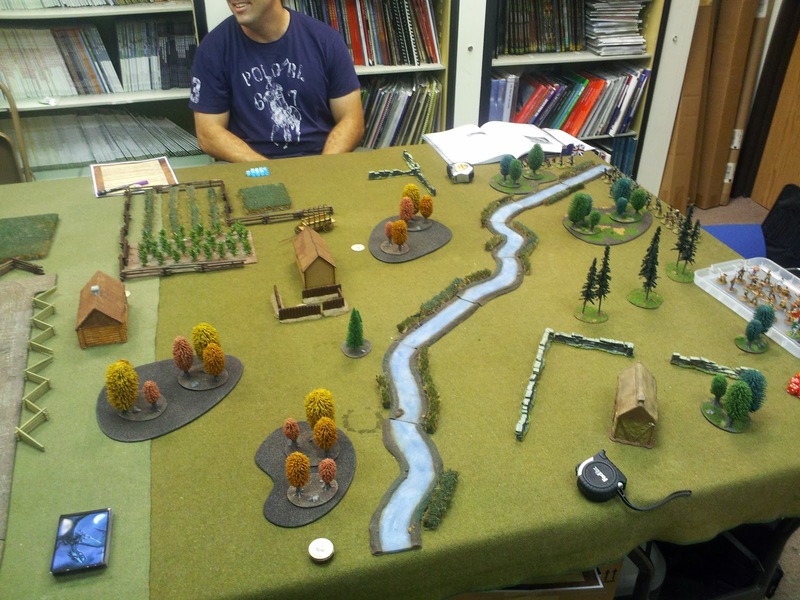 On the British side was Mark and Brian vs the French who was played by Richard and I. The table was 8ft x 5ft. 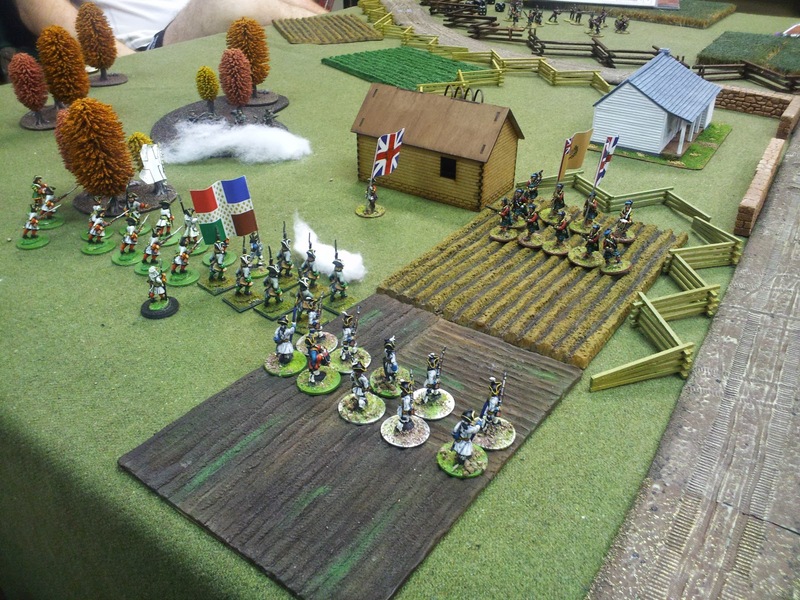 French objective was scouting, the British had Defence I think. 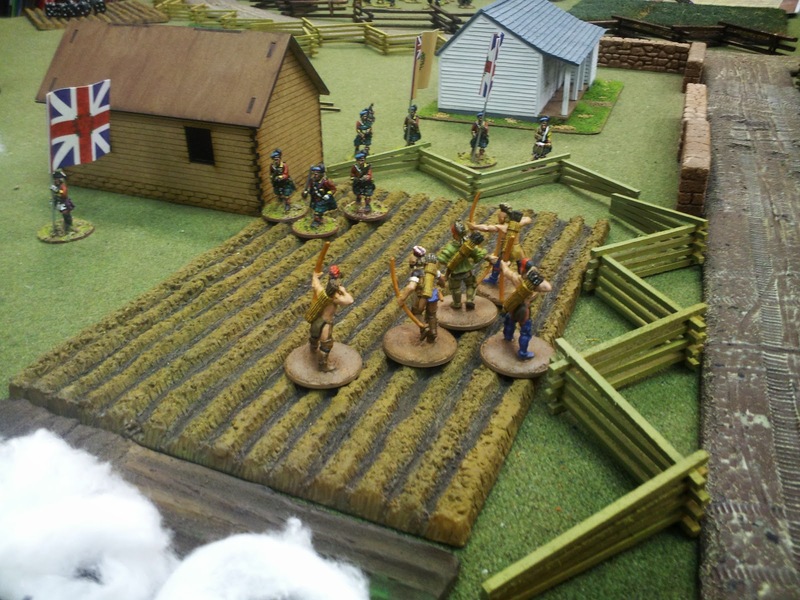 Two units of British Regulars deploy one deployed in line in front of the building, the other in the tall corn field, with a Officer newly arrived from the new world with them. Behind and left of the house is a hidden skirmishing unit, we believe to be Rangers. (ignore the british flag guys there not part of the unit just for looks). Our Forces start arriving onto the table. 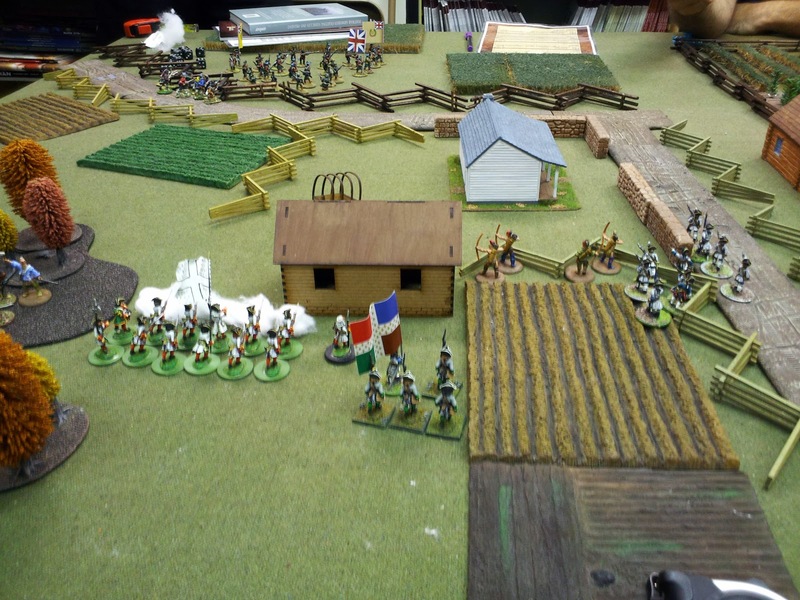 Bringing onto the table are two our a French Regulars, who promptly formed line and unload into the british line. Losing to many men the rest of that British unit turns and routs leaving their colors behind. Oh the shame of it all. Soon after followed onto the board with French Chasseurs in the corn field. indians following the banks of the stream. 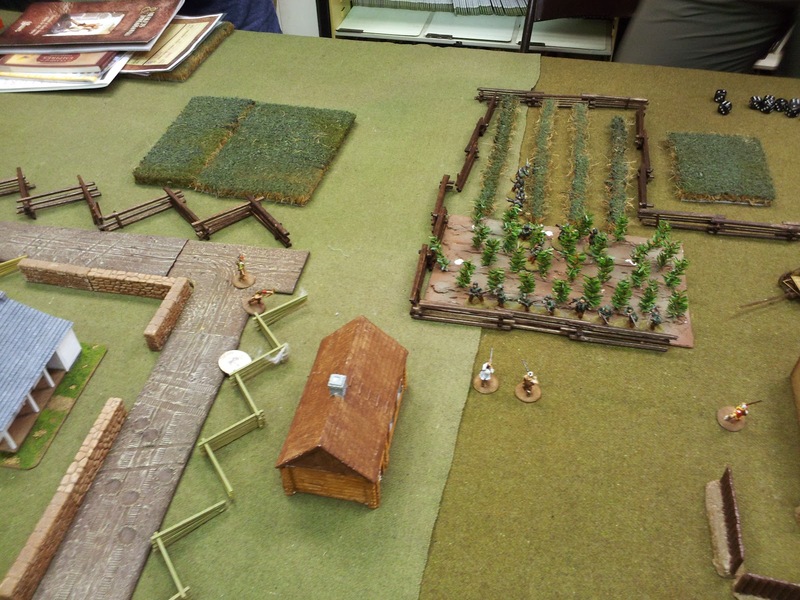 Revealed unit of French Indian allies attempt to use the steam banks for some concealment near the middle right of the board. 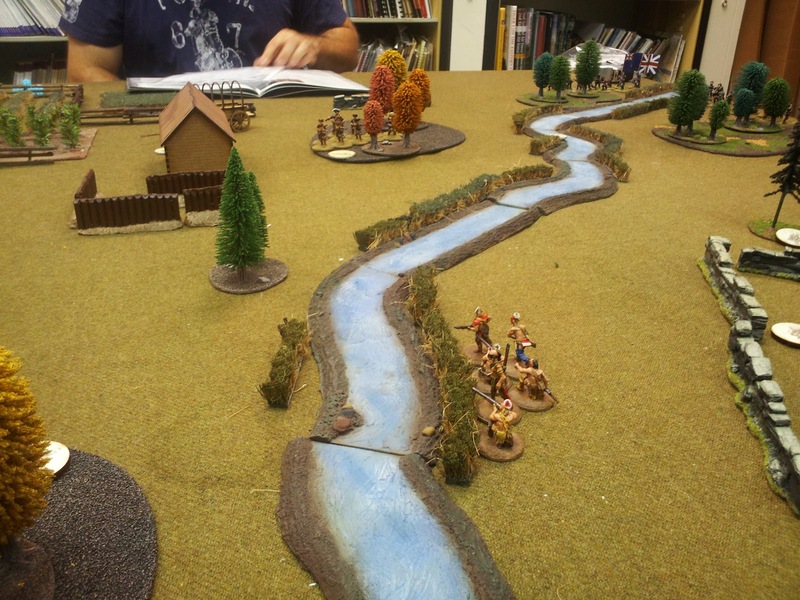 Indians with bows show up and move to get around the skirmishing French Chasseurs. This is the aftermath of the Indians charging into the British Regulars who make the awkward mistake of staying in Difficult Terrain. The British Regulars being reduced by musket and bow fire are reduced. Then charging in the indians let loose their tomahawks and crush the British, leaving two men with their Officer, who tries to keep them from fleeing. (the flag men and drummers are aesthetic markers not troops on the board). British Rangers soon after make it to a tree line where they shoot into a French Regular unit who was caught in line. Being finally reduced to five men. 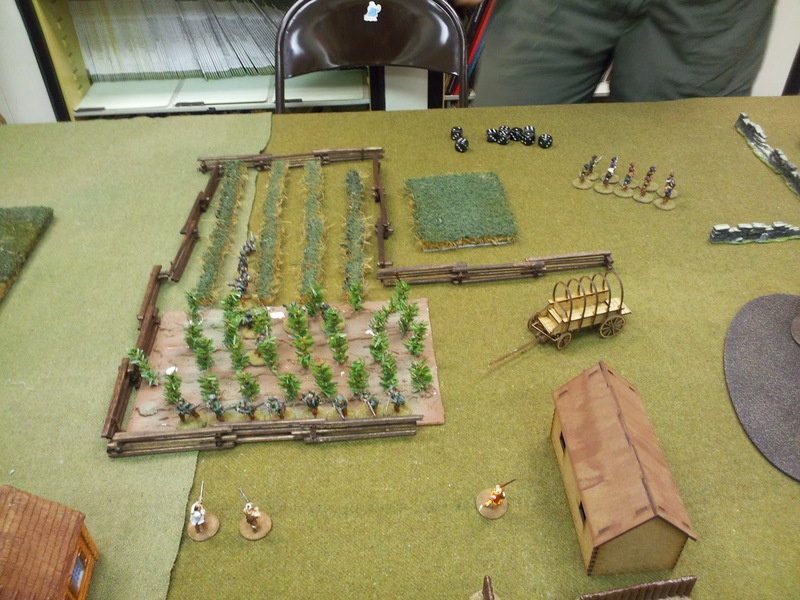 Our Canadian Militia moves around the left to try and scout out the far table quarter, while another unit of indians start to advance to the flank of the Rangers. 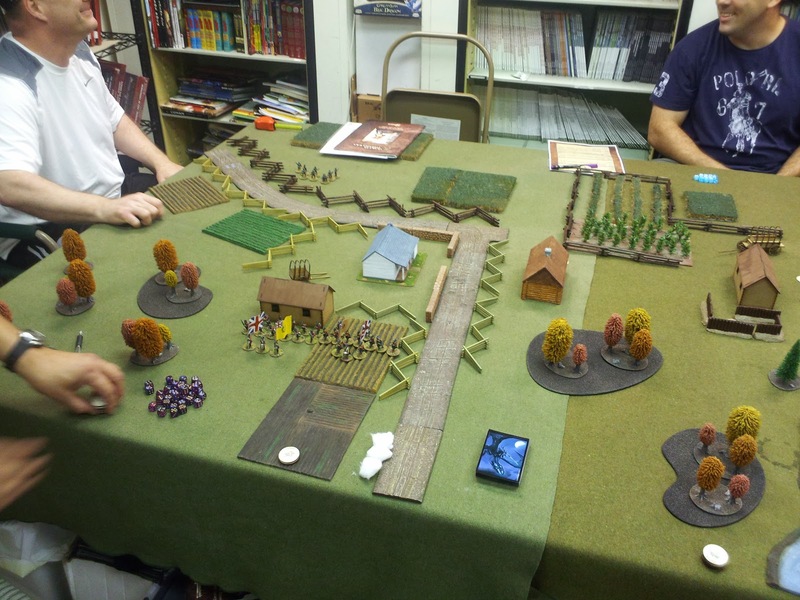 On the left of the picture the Rangers are charged in the flank losing 3 to 4 men and take flight towards the house, they get caught in a hail of musket shot and Point Blank range and a destroyed. The two men and officer are run over by indians in another melee, then take up potions on the fence line. 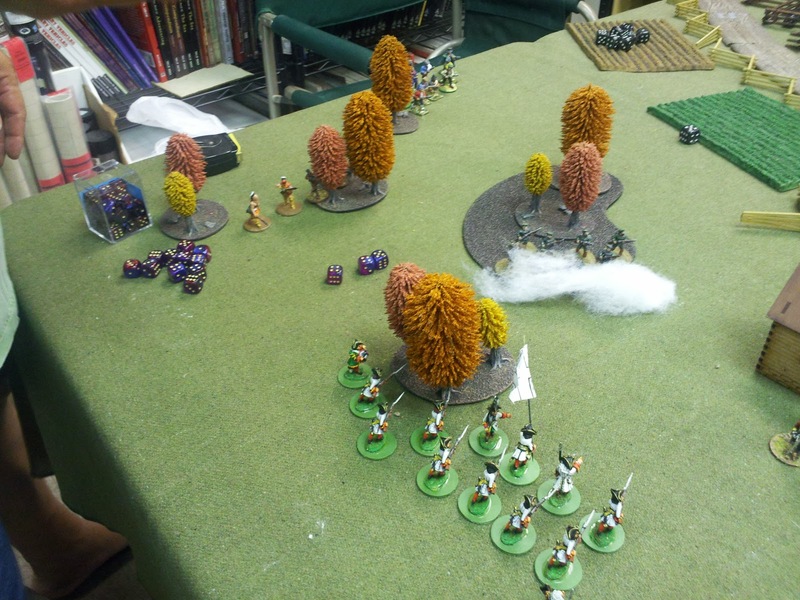 After squaring off in the middle for much of the game without shooting or being shot at I finally take a chance and run two units of indians out from cover towards the defending building near the middle of the table, one gets torn apart from two units of skirmish british who were on Vigilance. Reduced to 2 men, I run them back to the words. The other unit of indians are not fired upon. Objectives got flipped. French were scouting and British defending. Fixed the text. Let me know when you can play again.